Homecrest is pleased to introduce the new Harbor, Stella and Sutton collections, our first three entries in the new "Designed for Weight" category. Our "Designed for Weight" collections are made with both aluminum and plated steel, making them ideal for windy conditions. Aluminum is used for the arms and base to create a low-maintenance, less corrosive material for those high-wear components. To maintain a similar weight as our steel collections, the "Designed for Weight" collections use powdered-coated, solid-steel side rails and cross bars, along with a zinc-plated undercarriage and swivel rock components. 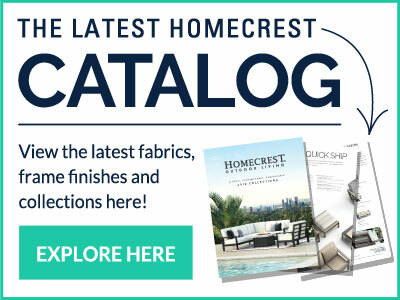 These collections are supported by Homecrest's 5-year finish and 15-year frame warranties, as well as the industry's only 5-year sling warranty. Learn more and view the Harbor, Stella and Sutton collections here.